Hi, I am interested in your 1969 Cadillac Eldorado (stock #1202-NSH) listed on Autotrader for $19,995. I'd like to get more information about this vehicle and confirm its availability. Large original V8, spacious cabin, and darning angular styling what was once the top luxury vehicle for the 60s is now a vintage cruiser with all the right flair. 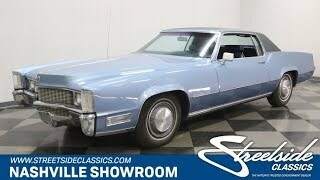 So when this 1969 Cadillac Eldorado is also so affordable, its time to take notice. The design lines of the sixth generation Eldorado are ones of legend. Its a true statement of personal luxury with flowing details. The extra long hood starts with a sharp middle point and begins a crease line that runs uninterrupted to the doors and emphasizes the sporty kick-up on the rear quarter panels. And the super-slick rear end was there to let you know the excess of the tailfin era was over, but this Cadillac still knew how to pay homage to its history. Also, while youre checking out the rear, take a look at the bumper. That chrome king is integrated into the design better than you can even get on a modern Cadillac. And if its brightwork you like, the front bumper shines just as brilliantly. The sheetmetal looks amazing, and the doors still shut with authority. And on top of this straight body is the original shade of Astral Blue that has the kind of gloss to highlight every crease so this Eldorado looks like a finely pressed suit. The pristine blue vinyl top not only gives this coupe a very European color scheme, but also it gives you a preview of the interior. Inside, youll love how everything from the wood paneling on the door to the plushness of the carpets have defied the decades. The drivers seat has been worn in a bit, but quite frankly, you probably wish you were this complete as you approach nearly half a century on this earth. Plus, you get the kind of luxury that made these Cadillacs so special in 1969, and the kind of options that you would expect in a brand new car today. This includes power seats, power windows, power locks, tilt steering wheel, rear defogger, the original AM/FM stereo, and provisions for automatic climate control. You sit behind the original Caddy three-spoke steering wheel and gaze at a clear gauge package. And all the controls are centered around you, because this is built to be a personal luxury machine. But on those days when you want to share the comfort with family and friends, the flat floor of the Eldorado means it really does offer relaxed seating for up to six total. The 472 cubic-inch V8 fills the engine bay, because this was the era when Cadillac was a true master at offering big motors with big power. And more than just being the original numbers-matching V8, you can really tell there has been proper care and maintenance over the years thanks to items like the fresh hoses and belts. Plus, there has been a great eye to preservation as noted by all the factory decals still present under the hood. This V8 keeps its original spirit right down to the Rochester four-barrel carburetor, which allows the big motor to inhale deeply. Best of all, emissions regulations had not yet robbed Detroit of horsepower, so youve got an abundance of muscle to move this luxury machine with ease. The cruising attitude is heightened by a smooth-shifting three-speed automatic transmission, power steering, and front disc brakes. A true classic with the right colors and plenty of luxury. This is a great turnkey Caddy at an unbeatable price. So you know a deal like this will be moving soon. Call today!! !